Running shoe technology has advanced significantly in the last 50 years, although the overall injury rate has yet to decrease. Barefoot (BF) running has become increasing more popular in the last 10 years. The current investigation aimed to explore differences in the forces produced by the foot muscles during BF and shod (SH) running. Fifteen male participants ran at 4.0 m.s-1 (± 5%). Kinematics were measured using an eight-camera motion analysis system alongside ground reaction forces. Peak and average stance phase forces from the flexor digitorum longus (FDL), flexor hallucis longus (FHL), peroneus longus (PL), extensor digitorum longus (EDL) and extensor hallucis longus (EHL) muscles were obtained using OpenSim v3.2. 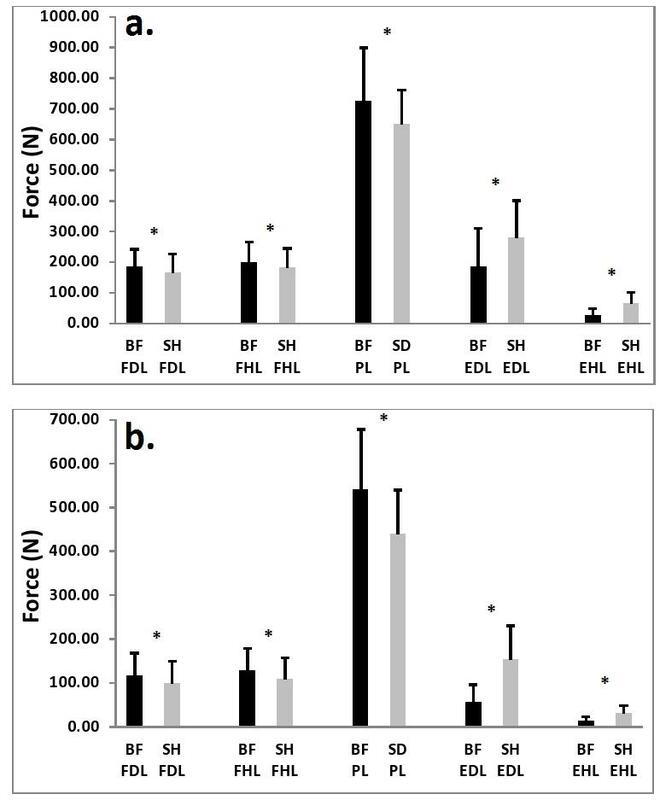 Peak and average forces of the FDL, FHL and PL muscles were significantly larger when running BF, whereas peak and average forces of the FHL and EHL muscles were significantly larger when running SH. This study supports the conjecture that the plantar muscles are required to work harder when running BF in relation to SH, indicating that BF training may serve to strengthen the foot musculature. Running training is known to be physiologically beneficial, serving to enhance the cardiovascular system and reduce morbidity . Recreational running is therefore becoming increasingly popular, with over 50,000,000 participants in the US alone . The vast increase in the running population has created a large market leading to a corresponding increase in running equipment sales . Running footwear technology has expanded significantly in recent years as researchers and manufacturers seek to control the incidence of chronic injuries through reductions in impact loading and skeletal mal-alignment . However, despite the advances in footwear technology, chronic injuries related to running are equally as prevalent as always with up to 75% of recreational runners becoming injured each year . For many thousands of years human beings have performed their running activities barefoot (BF) and only in the last 50 years has the modern running shoe as we know it been considered an essential piece of equipment . There is currently a trend in footwear biomechanics and also the running community towards the adaptation of barefoot running . This trend has garnered a significant amount of attention from both the media and biomechanical researchers, based on the supposition that the absence of footwear can mediate a reduction in running injuries . The mechanical characteristics of modern running footwear enhance overall comfort , but may also potentially reduce the demands placed on the foot musculature . Although conventional running shoes are designed with specific features designed to reduce kinetic and kinematic mechanisms linked to the etiology of injury, these features may however interfere with normal foot function  and reduce the extent of the work output of the foot muscles . During the loading phase of stance, the medial longitudinal arch serves to deflect inferiorly, recruiting the muscles that support the arch allowing elastic energy to be stored and then subsequently released in the push off phase . Under recruitment of the foot musculature as a function of habitual footwear utilization has been linked to weakness of the muscles of the foot . Currently the notion that traditional running shoes promote weakness of the foot muscles is purely circumstantial; largely do the challenges associated with quantifying foot muscle forces. However, specific software has been developed that allows the kinetics of some foot muscles to be estimated during dynamic situations, using motion capture based data . The aim of the current investigation was to examine the differences in the forces produced by the foot muscles during BF and shod (SH) running. A study of this nature may provide data with important clinical implications regarding the development of the foot musculature. Fifteen male recreational runners, completing at least 35 km per week, volunteered to take part in this study. All were free from musculoskeletal pathology at the time of data collection and provided written informed consent. The mean characteristics of the participants were; age 23.46 ± 2.54 years, height 175.54 ± 5.84 cm and body mass 72.16 ± 6.65 kg. The procedure utilized for this investigation was approved by the University of Central Lancashire, School of Sport Tourism and Outdoors, ethical committee in agreement with the principles outlined in the declaration of Helsinki. Participants ran at a velocity of 4.0 m.s-1 ±5%, striking an embedded force platform (Kistler, Kistler Instruments Ltd., Alton, Hampshire) with their right (dominant) foot . The velocity of running was monitored using infrared timing gates (Newtest, Oy Koulukatu, Finland). The stance phase was defined as the duration over which 20 N or greater of vertical force was applied to the force platform. All runners completed five successful trials in each condition. Kinematics and ground reaction forces data were synchronously collected using an analogue to digital interface board. Kinematic information was obtained at a frequency of 250 Hz using an eight camera optoelectric system (Qualisys Medical AB, Goteburg, Sweden). To define the anatomical frames of the thorax, pelvis, thighs, shanks and feet retroreflective markers were placed at the C7, T12 and xiphoid process landmarks and also positioned bilaterally onto the acromion process, iliac crest, anterior superior iliac spine, posterior super iliac spine, medial and lateral malleoli, medial and lateral femoral epicondyles and greater trochanter. Carbon-fiber tracking clusters comprising of four non-linear retroreflective markers were positioned onto the thigh and shank segments. Static calibration trials were obtained with the participant in the anatomical position allowing the positions of the anatomical markers to be referenced in relation to the tracking clusters/markers. Marker data were digitized using Qualisys Track Manager in order to identify anatomical and tracking markers then exported as C3D format files to Visual 3D (C-Motion, Germantown, MD, USA). Ground reaction force and kinematic data were smoothed using cut-off frequencies of 25 and 12 Hz with a low-pass Butterworth 4th order zero lag filter. The stance phase was exported from Visual 3D to OpenSim software (Simtk.org, Stanford USA), which was utilized to quantify muscle forces during BF and SH running. Simulations of muscle forces were undertaken using the generic gait2392 model within OpenSim v3.2. This model corresponds to the eight segments that were exported from Visual 3D and features 19 total degrees of freedom and 92 muscle-tendon actuators. The muscle intrinsic properties were modelled using the Hill recommendations based on the links between force-velocity-length . These muscle properties were scaled for each individual based on the recommendations of Delp et al., . Following this residual reduction algorithm (RRA) was employed within OpenSim; this utilized the inverse kinematics and ground reaction forces that were exported from Visual 3D. The RRA calculates the joint torques required to re-create the dynamic motion. The RRA calculations produced route mean squared errors <2°, which correspond with the recommendations for good quality data. Following the RRA, the computed muscle control (CMC) procedure was then employed to estimate a set of muscle force patterns allowing the model to replicate the required kinematics . The CMC procedure works by estimating the required muscle forces to produce the net joint torques. Following the CMC procedure, average and peak forces during the stance phase were calculated for the flexor digitorum longus (FDL), flexor hallucis longus (FHL), peroneus longus (PL), extensor digitorum longus (EDL) and extensor hallucis longus (EHL) muscles on the right side. The shod condition during this study consisted of New Balance 1226 running trainers. The shoes were the same for all runners; they differed in size only (sizes 8-10 in men’s shoe UK sizes). Descriptive statistics (means and standard deviations) were obtained for each footwear condition. Shapiro-Wilk tests were used to screen the data for normality. Footwear mediated differences in foot muscle kinetics were examined using paired samples t-tests. To control type I error, statistical significance was accepted at the p<0.01 level based on the number of comparisons being made. Effect sizes for all significant findings were calculated using partial Eta2 (pη2). All statistical actions were conducted using SPSS v22.0 (SPSS Inc., Chicago, USA). Figure 1 displays foot muscle force distributions as a function of different footwear. The results indicate that the outcome muscle kinetics were significantly influenced by BF and SH running conditions. Figure 1 Foot muscle kinetics as a function of footwear. * denotes significant difference. (black = barefoot and grey = shod) (a. = peak muscle forces and b. = average muscle forces). Peak forces of the FDL (t (14) = 2.74, pη2 = 0.59), FHL (t (14) = 2.36, pη2 = 0.53), and PL (t (14) = 2.80, pη2 = 0.60) muscles were significantly larger in the BF condition in relation to running SH. Conversely peak forces at the EDL (t (14) = 4.73, pη2 = 0.78) and EHL (t (14) = 3.41, pη2 = 0.67) muscles were significantly larger when running SH in comparison to BF (Figure 1a). Average forces of the FDL (t (14) = 5.62, pη2 = 0.82), FHL (t (14) = 3.91, pη2 = 0.72), and PL (t (14) = 2.49, pη2 = 0.55) muscles were significantly larger in the BF condition in relation to running SH. Conversely peak forces at the EDL (t (14) = 5.21, pη2 = 0.81) and EHL (t (14) = 3.45, pη2 = 0.68) muscles were significantly larger when running SH in comparison to BF (Figure 1b). The current investigation aimed to determine the differences in the forces produced by the foot muscles during BF and SH running. To the authors knowledge this represents the first comparative investigation of the foot muscle forces measured when running BF in relation to SH. The first key finding from the current investigation was that both average and peak forces of the FDL, FHL and PL muscles were found to be significantly larger when running BF in relation to SH. Secondly it was also demonstrated that average and peak forces of the FHL and EHL muscles were significantly larger when running SH. It is proposed that these observations relates to the differences in sagittal plane ankle kinematics typically observed as a function of running BF [5, 7]. When running BF the ankle exhibits considerably more plantarflexion in comparison to running SH [5, 7]. Changing from a rear to a mid/fore foot strike pattern has been associated with increased foot muscle recruitment and thus greater mechanical work performed by the foot musculature . The findings in relation to the current investigation support this notion, the FDL, FHL and PL muscles are all active plantar flexors whereas the FHL and EHL muscles serve to dorsiflex the foot segment; therefore these observations appear to make intuitive sense. Further to this, running BF has been linked to increases in medial longitudinal arch deflection during the loading phase of running . Contraction of the FDL, FHL and PL muscles with their distal insertions at the metatarsal/ phalanx serve to stabilize the deflection of the arch when under tension . This windlass mechanism is much less pronounced during SH running  as the thus the extent of muscle force required to support the arch is reduced. Furthermore the current study supports the observations of Miller et al.,  who demonstrated increases in foot muscle cross-sectional area following a 12 week training program using minimal footwear. Although their muscles were distinct from those in this study this nonetheless provides further experimental evidence to support the notion that BF running may serve to strengthen the plantar foot musculature. Weakness in the foot musculature may have clinical significance with regards to the etiology of running injuries. Firstly weakness in the plantar foot musculature as a function of habitual footwear utilization may lead to a lowering of the medial longitudinal arch, as the supporting structures are no longer able to produce sufficient tension to maintain arch stiffness . A lowering of the arch would firstly reduce the potential for elastic energy storage  but may also promote higher levels of foot eversion that have been associated with lower arch structures . Increases in foot eversion and accompanying tibial internal rotation have been linked to the etiology of a number of chronic pathologies . Weakness of the plantar musculature may also lead to an increased risk from plantar fasciitis. As plantar muscle strength diminishes their ability to maintain normal foot and arch structure during running is diminished, thus the load that must be borne by the plantar fascia is enhanced . A limitation to the current musculature is that an all-male sample was used. Although gender differences in foot muscle mechanics have yet to be investigated, Sinclair et al.,  demonstrated that foot kinematics and plantar fascia kinetics differed as a function of gender. This therefore indicates that foot muscle function may differ between genders. It is recommended that this investigation be repeated using a female sample to improve generalizability. A further drawback from this investigation is that OpenSim does not model all of the muscles associated with foot function. Muscles purely intrinsic to the foot such as the flexor digitorum brevis, abductor digiti minimi and abductor hallucis therefore cannot be quantified. Future developments in inverse muscle modelling to include these muscles are required before additional information regarding their recruitment as a function of BF running can be examined. In conclusion, although previous analyses have comparatively examined the mechanics of BF and SH running the current knowledge concerning the differences in foot muscle forces between the two modalities is limited. The current investigation addresses this by providing a comparison of foot muscles forces when running BF and SH. The current study shows that that peak and average forces from FDL, FHL and PL were significantly larger in the BF condition whereas EDL and EHL were significantly larger when running SH. Firstly these observations provide further insight into the mechanical alterations that runners make when running BF. In addition, this study supports the conjecture that the plantar muscles are required to work harder when running BF in relation to SH, indicating that BF training may serve to strengthen the foot musculature. Aguinaldo A, Mahar A. Impact loading in running shoes with cushioning column systems. Journal of Applied Biomechanics 2003; 19: 353-360. Zajac FE. Muscle and tendon: properties, models, scaling, and application to biomechanics and motor control. Critical Reviews in Biomedical Engineering. 1989; 17: 359–411,. This entry was posted in Uncategorized and tagged barefoot, medial longitudinal arch, muscle force. Bookmark the permalink.